It’s back to a more traditional oval circuit for Aric Almirola and the No. 10 Smithfield Ford Fusion team for Stewart-Haas Racing (SHR) this weekend at Kentucky Speedway in Sparta. The intermediate ovals like Kentucky’s dominate the 36-race Monster Energy NASCAR Cup Series schedule. Almirola heads to the Bluegrass State after a 27th-place finish last weekend at the 2.5-mile Daytona (Fla.) International Speedway restrictor-plate track. He was involved in a 24-car accident at the beginning of Stage 2, and from there the No. 10 Smithfield crew worked hard to make repairs to Almirola’s Ford Fusion, allowing him to return to the track. However, a second on-track incident ended the Ford driver’s night prematurely. For the second consecutive weekend, the Cup Series has a main event under the Saturday-night lights. Saturday-night races are overwhelming fan favorites as they enjoy seeing racecars leave sparks as they navigate the track under the lights, and teams find themselves dealing with considerable handling changes on the Cup Series cars as the race begins in the daylight and ends at night. Two weeks ago at the 1.5-mile Chicagoland Speedway oval in Joliet, Illinois, Almirola led 70 laps and earned 10 stage points and one playoff point before he was relegated to a 25th-place finish. At 1.5-mile tracks this season, the Tampa native hasn’t finished outside the top-13, with the exception of a 32nd-place finish at Texas Motor Speedway in Fort Worth due to an accident, and Chicagoland’s finish due to pit-road issues. In 18 Cup Series starts this year, Almirola has accrued an average start of 19.7, an average finish of 13.3, and he rounds out the SHR four-driver contingent with the 10th spot in the point standings. In five career starts at Kentucky Speedway, Almirola has a best finish of 12th, earned in July 2015. The SHR driver also has two career Xfinity Series starts at Kentucky with a best finish of sixth earned in June 2007. Additionally, he has three starts in the Camping World Truck Series with two top-five finishes. This weekend, Almirola is supporting fellow competitor Jimmie Johnson’s foundation by wearing a special helmet visor strip during the 267-lap event. At the race’s conclusion, Almirola will autograph the visor, which will then be available in an online auction to raise funds for the Jimmie Johnson Foundation’s support of K-12 education. 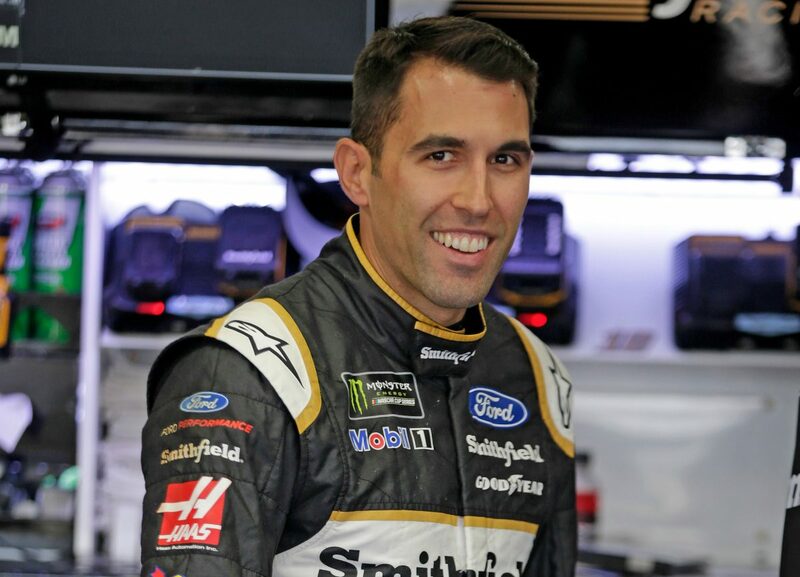 This weekend’s event at Kentucky Speedway in Sparta marks the 17th points-paying event during which the Smithfield livery has adorned Almirola’s No. 10 Ford Fusion. Smithfield, a brand of Smithfield Foods, which is based approximately five hours northeast of SHR headquarters in Smithfield, Virginia, is in its seventh season with Almirola and its first with SHR. Founded in 1936, Smithfield is a leading provider of high-quality pork products, with a vast product portfolio including smoked meats, hams, bacon, sausage, ribs, and a wide variety of fresh pork cuts. Ford has earned eight wins so far this season with Almirola’s SHR teammates earning seven of the victories for the blue oval – five by Kevin Harvick and two by Clint Bowyer. Harvick also captured the non-points-paying All-Star Race win at Charlotte. How much different is a night race versus a day race? How are you gelling with your team as the season goes on?